Michael Moore and wife Kathleen Glynn at 2004 movie premiere. Celebrity Marxist Michael Moore is apparently one more male filmmaker who doesn’t practice what he preaches and may even be a tax-evader who “got over” on the Internal Revenue Service. According to Kathleen Glynn, the ex-wife of Michael Moore, she is filing a lawsuit against the writer-director claiming he never paid her money owed to her from his movie profits. She claims the money was part of a 2014 divorce settlement, which would have included cash made from his Oscar-winning “documentary” Fahrenheit 9/11 rightfully owed as a result of their 2014 divorce settlement. Ms. Glynn’s civil suit alleges that the man known to be the father of fake news has stonewalled an arbitration agreement needed to “flesh out the terms of an important provision in their property settlement,” say reporters from the New York Post. Moore’s attorneys claim he wants all of the benefits of their 2014 settlement in which Glynn “signed over essentially all of her interest in the fruits of the parties’ joint efforts as film-makers … in exchange for a promise of future revenue-sharing by” her husband. “She was the driving force in the making of many of [his] films and other ventures in which Mr. Moore was the featured personality, dating back to their first big success, ‘Roger and Me’ (1989),” Glynn’s attorney writes. Glynn’s lawsuit will claim that Moore was supposed to pay his ex-wife four percent (4%) of the total revenue from his films, but he paid her less than $600 in 2014. Moore claims he reported losses to the IRS in 2014 and again 2016 – negative $350,862 in 2014 and negative $221,025 in 2016 – but Glynn believes the figures are false since it’s widely known Moore lives a lavish existence. “Anyone who knows Moore, knows he is a wealthy man preaching to people the importance of paying higher taxes in order to help the poor and needy,” said Laurie Feanstera, a former New York cop and Trump-supporter. During an interview in 2003 with Bill O’Reilly, Moore said that the well-to-do Americans should pay tax rates up to 80% of their earnings for a start. 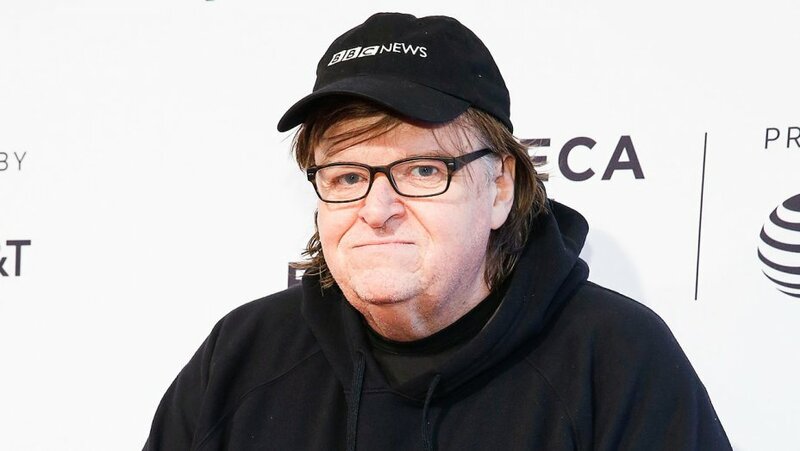 “Michael Moore is a fake journalist and a phony documentary filmmaker, but the news media are quick to defend him and many of them actually imitate him. We’re talking about people like MSNBC’s Joe Scarborough, CNN’s Don Lemon, and others who claim they are unbiased reporters,” Feanstera said. Moore’s latest film, Fahrenheit 11/9, premiered during the world-famous Toronto Film Festival earlier this week. The title of his film pays homage to himself and his anti-Bush documentary, Fahrenheit 9/11 and references the date the 2016 election results became official. It’s an anti-Trump movie and no doubt it will be rewarded with big box office receipts and great, boot-licking critics’ reviews.